As of right now, traffic can travel in both directions on Front Street in Portsmouth. City Council is expected to make the street one way soon, to accommodate a multi-use path. Ward 1 Portsmouth City Councilman Sean Dunne said the project has been in the works for at least two years. It could take a quantum leap forward in the next few weeks as, according to Dunne and city Community Development Director Tracy Shearer, Portsmouth City Council should be voting in the very near future on whether to accept grants and proceed with plans to develop a multi-use path alongside Front Street near Portsmouth’s iconic flood wall murals. Shearer said the city has received two grants totaling roughly $810,000 to pay for the multipurpose path which will sit between Front Street and the flood walls. Portsmouth received the majority of that money, over $622,000, from the Ohio Department of Transportation, with over another $187,000 coming from the Ohio Department of Natural Resources. As Dunne said, the project has been on the table for some time. The city even held a public meeting on the project in March of last year. At the time, Shearer said the pathway has been in the works since 2015. Portsmouth unsuccessfully applied for grants for the work in 2016. The city apparently was in the midst of another grant application at the time of the March 2018 public meeting. During that meeting, many public comments seemed to focus on whether there was a need for a walking/bike path. 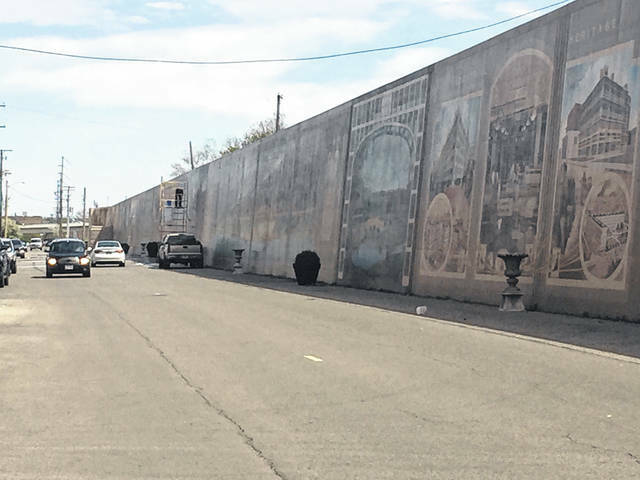 Several persons argued there is already a sidewalk running parallel to the flood wall murals, a sidewalk that essentially serves as a pedestrian pathway. The maxim “if it’s not broke, don’t fix it,” was repeated several times. “A final design is required for the grant application, which included a one-way street conversion, and is why the one-way conversion is necessary for the project to move forward. Without the conversion we essentially forfeit the grant,” Shearer wrote in an email sent to the Daily Times following the 2018 hearing. The city had been working with an out-of-town firm, the Poggemeyer Design Group, on the plans for the pathway. In 2018, company representatives contended removing one lane of Front Street seemed the best way to make room for the multi-use path. Plans call for the pathway to sit directly next to the flood wall murals, with Front Street reduced to one lane, sitting just to the north of the pathway. While the pathway seemed a hot topic at the time of that public meeting over a year ago, the project seemed to drop off the radar for some time. What has taken so long for the idea to move forward? Both Dunne and Shearer mentioned the city needed to work with Shawnee State University to obtain property in order to run the path from Alexandria Point, along Front Street, then south of SSU to Offnere Street. Shearer also talked a bit about working out some solution to the concerns of at least one business owner who strenuously objected to making Front Street one-way. Last year, Ernie Vastine, owner of Valley Wholesale Foods which operates a warehouse on Front Street, said making the road one-way would create problems for him in terms of getting his trucks into his facility. Vastine could not immediately be reached for comment, but Shearer indicated he and the city had come to some agreement. “It’s been a slow-moving project,” Shearer said. But she added she hopes construction can begin on the multipurpose path sometime in the fall. She chose not to offer even a guesstimate as to how long construction might take. Shearer went on to describe the pathway as an attempt to draw people downtown as well as allow better and safer viewing of Portsmouth’s famed flood wall murals. In addition to the Front Street pathway, Shearer said another long talked about project is about to get underway as work on Portsmouth’s first off-leash dog park should begin May 14. The project requires only fencing, some concrete work, along with installation of a water line. With that in mind, Shearer said she hopes to have the park, to be built on currently vacant property next to the city police station, open to the public by the end of next month. In January, Dunne stated the park is to be dubbed the “Spock Memorial Dog Park” in honor of a Scioto County K-9 officer killed in the line of duty in 1994. Dunne had made building the park a campaign promise when he first ran for council in 2017. But in talking about the project earlier this year, Dunne quickly added the effort to bring Portsmouth a dog park started long before he arrived on the scene. “People had looked into it a few years previously,” he said, openly sharing credit for bringing the park to fruition with local businessman Ben Davis of Alarm Tech Services as well as Shearer. While talking to the Daily Times in January, Dunne said he and Davis spent a lot of time researching dog parks, even traveling to look at a park in Columbus. Davis said local design firm owner Gina Chabot came up with the general design for the Portsmouth park, though Davis also said he wants to incorporate some of the features of a dog park he visited with his daughter in Beverly Hills, Calif. While both Davis and Dunne talk about the park having plenty of support, including from the entire city council, Davis was careful to point out the park will have closed-circuit security cameras. https://www.portsmouth-dailytimes.com/wp-content/uploads/sites/28/2019/04/web1_Floodwall.jpgAs of right now, traffic can travel in both directions on Front Street in Portsmouth. City Council is expected to make the street one way soon, to accommodate a multi-use path.